André Cazalet begins his studies of music at an early age and wins two first prizes at the Conservatoire National Superieur de Musique de Paris. 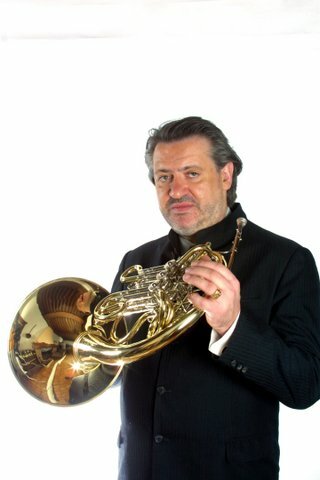 After having been a soloist in Pierre Boulez’ l’Ensemble InterContemporain, he has been the first principal horn in l’Orchestre de Paris since 1980. At the same time he is pursuing a soloist career that leads him to perform with conductors such as Christoph Eschenbach, Paavo Järvi, Semyon Bychkov, Wolfgang Sawallisch, Peter Eotvos,John Nelson, Michel Plasson, Antonio Papano, Walter Weller etc. Being a sought-after artist in chamber music he has performed in particular with musicians such as Daniel Baremboïm, le Quatuor Talich, Pascal Rogé, Gérard Caussé, Maurice Bourgue, Katia et Marielle Labèque, Jean Pierre Rampal, Emmanuel Pahud, Schlomo Mintz, Christoph Eschenbach, Pierre Laurent Aimard, Christian Tetziaff, Boris Berezovsky, Julian Rachlin. His repertoire spreads from the 18th century through to today and he also does research work with composers of the upcoming generation. He is the dedicatee and creator of numerous works for his instrument. André Cazalet has been teaching at the Conservatoire National Supérieur de Musique de Paris since 1985 and has also been invited to teach at well-known institutions such as: the Tchaikovsky conservatory in Moscou and Rimsky Korsakov conservatory in St Petersburg, universities of Vienna and Tokyo, Musikhochschule in Hamburg, Freiburg, Munich etc. His discography comprises amongst others Haydn’s and Mozarts concerti and his recording of the trios for piano, violin and horn by Brahms and Ligeti has received the Grand Prix du Disque. Nominated at the Victoires de la Musique 2011, André Cazalet is Chevalier n the Ordre des Arts et des Lettres.